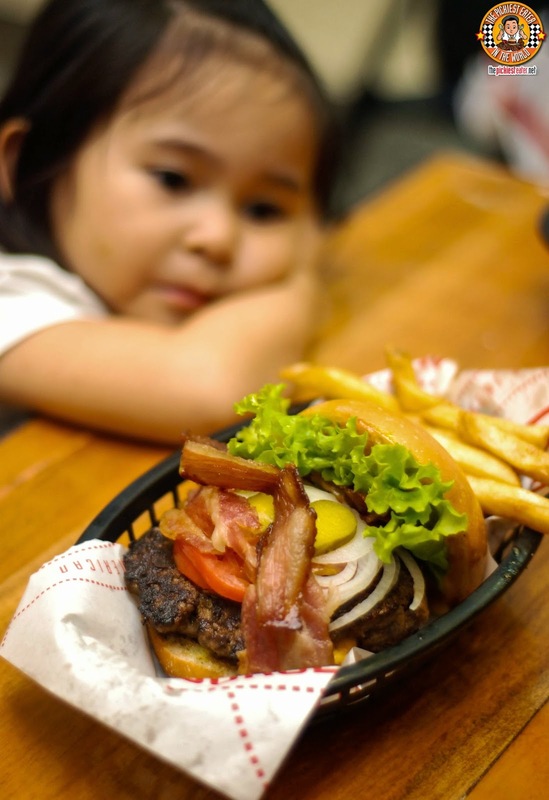 THE PICKIEST EATER IN THE WORLD: BUSTIN' OUT OF THE BURGER JOINT! Here's some word of advice. Never.. and I mean EVER go grocery shopping on an empty stomach. Your hunger will get the better of you and you'll find yourself finding the strangest things appealing ("Those Malunggay flavored Tofu Chips look good, ha? "), leading you to buy practically every snack in sight. After an incident where my grocery bill was nearly double my normal average, and I was left with a cart of useless junk food, I learned my lesson. Just before Rina, Rain and I were about to head out to the grocery, I suggested we eat first. Since we were going to be joined by her sister Pink Turbo and our dad (My father in law), it was the perfect time to do a little family bonding. 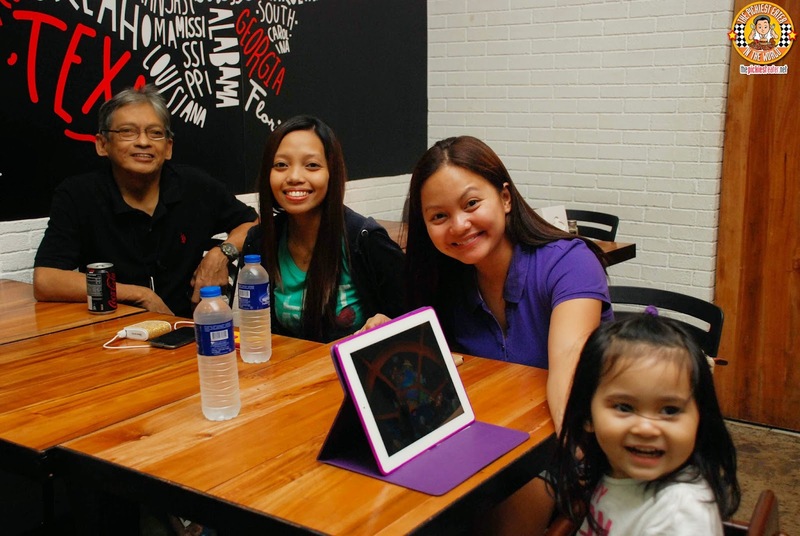 Since we were going to do our grocery shopping there anyway, we decided that it would be more convenient to choose from the selection of restaurants around the SM Super Center/Tiendesitas area. A restaurant had caught my eye a couple of weeks earlier when I had my license renewed at SM Super Center Pasig. 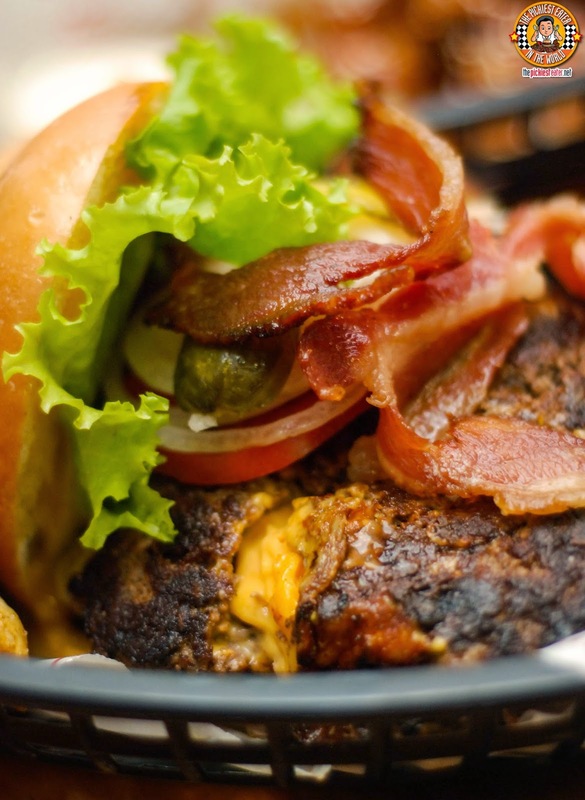 It turns out, I would discover one of the best burger places you may not have heard of just yet.. but once it catches on, I assure you, you won't forget the name. It is plain and simply called, "The Burger Joint". I didn't realize that I had heard of The Burger Joint before.. Late last year to be exact, when an Instagram follower graciously tagged me in a photo of a mouthwatering burger. I had sworn that I would go for a visit, but the holidays happened and I ended up forgetting about it. 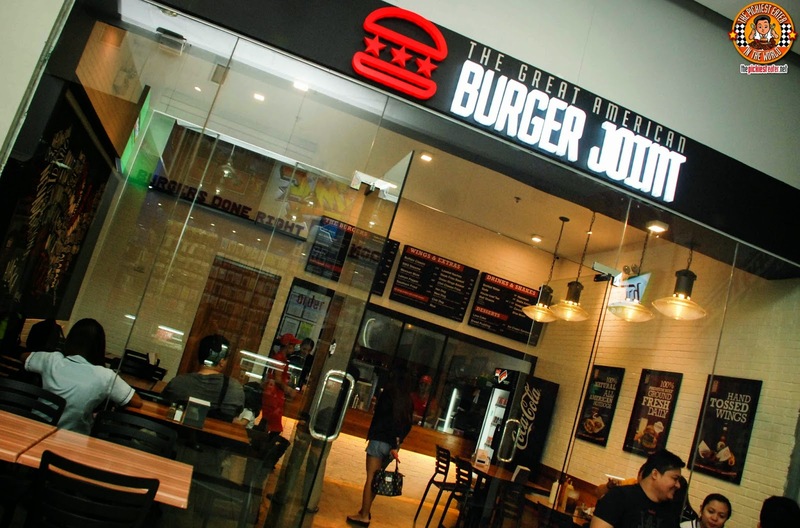 The Burger Joint is located within the Ground floor of SM Super Center Pasig. It's located right beside the inside entrance of Krispy Kreme. We were there on a Holiday weekend, so there was also a steady flow of customers, resulting in the dining area feeling a little bit cramped. Nonetheless, the interiors were simple and clean, but at the same time had a rugged charm to it. 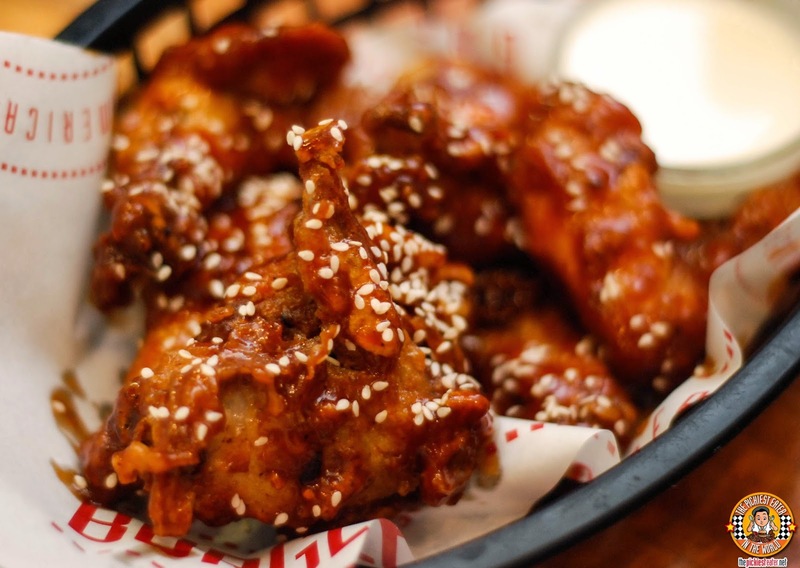 We started off our meal with the BBQ Sesame Wings (P179). 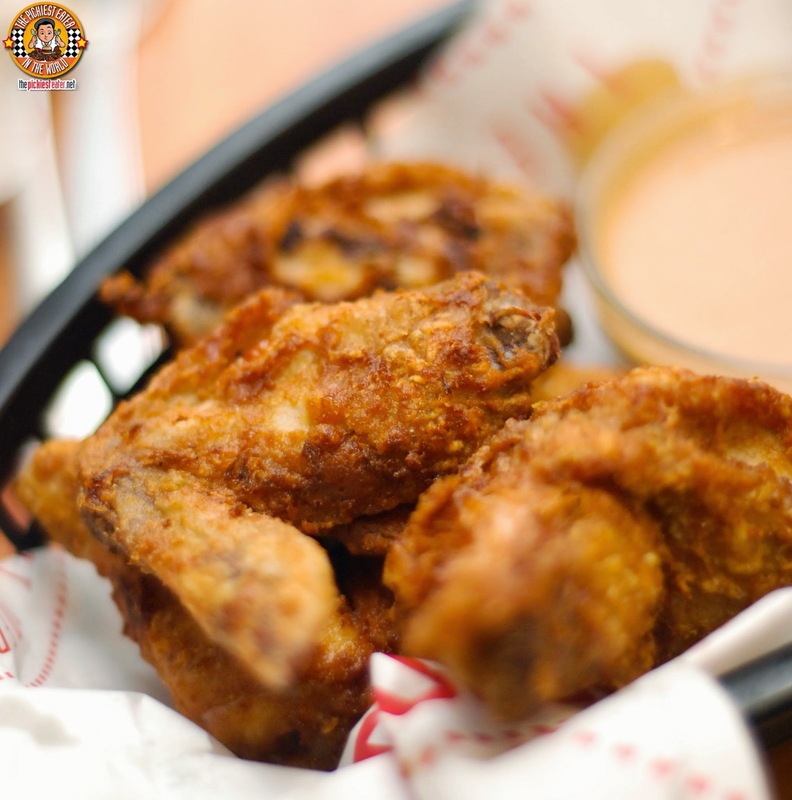 The wings were coated in a sweet sauce that had a gentle hint of smokiness creating a nice balance of flavors. Pink Turbo ordered the Southern Fried Chicken Wings (P229) which unfortunately, took a little longer than we would have preferred, but when it comes to chicken, I always say it's better to wait than have it served to us raw. Perhaps the kitchen also wanted to play it safe, so we appreciated that. It looked a bit dry, but that notion was quickly debunked when I bit into it and got juicy chicken meat, which Pink Turbo ended up eating with rice. Though the cook on the chicken was really good, it could have used just a pinch more salt. The gravy, on the other hand could be significantly improved. I'm the kind of guy that LOVES gravy.. I could pour that stuff on rice and make it my meal, but I couldn't make out the flavor on this. It was a mix of being bland to a little bit milky. We got Baby Rain a Plain Hot Dog (P129), which she enjoyed.. Particularly the bread. Pretty standard-issue-no-frills stuff here.. A nice, juicy sausage that had a great snap to it, to go with its meaty flavor. 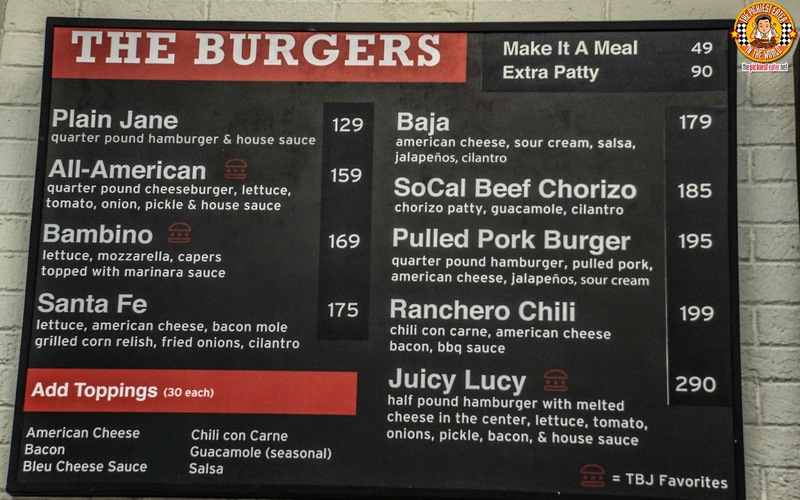 Though they dub themselves "The Great American Burger Joint", the Mexican influences are highly evident. 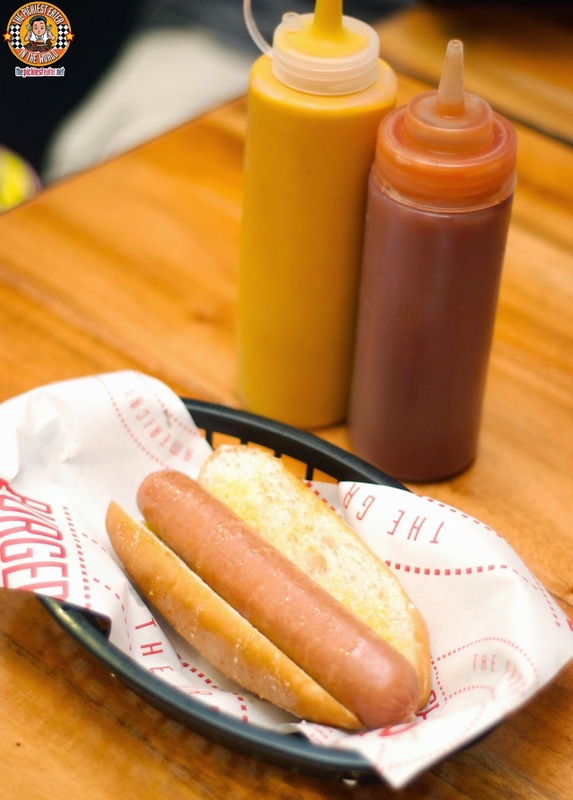 Many of the ingredients are peppered with classic Mexican condiments, creating delicious, South Western style burgers. 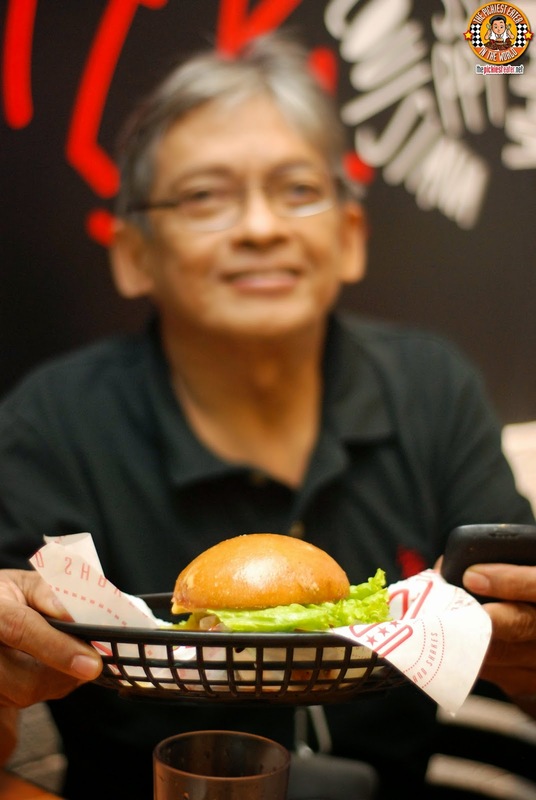 My father in law decided to go with Burger Joint's simple, "All American" Burger (P159). 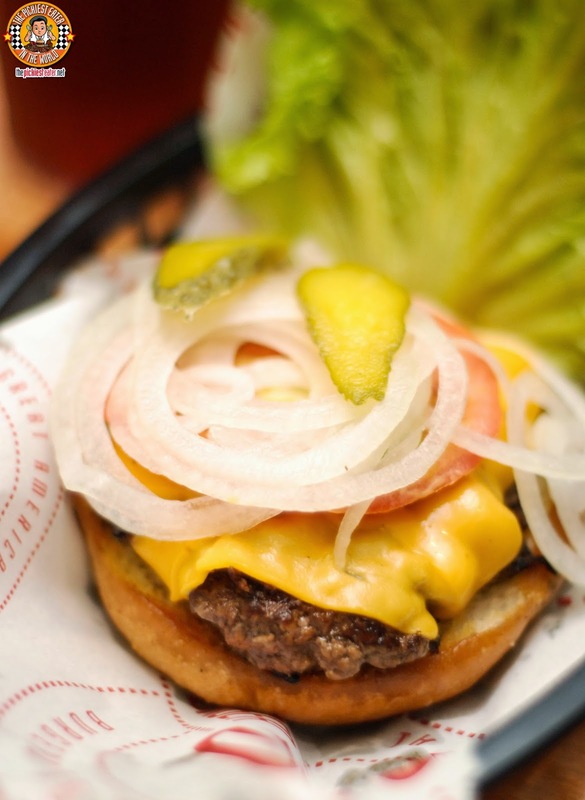 The 100% Pure Beef Patty is masterfully grilled, then blanketed in a slice of melted Cheese. 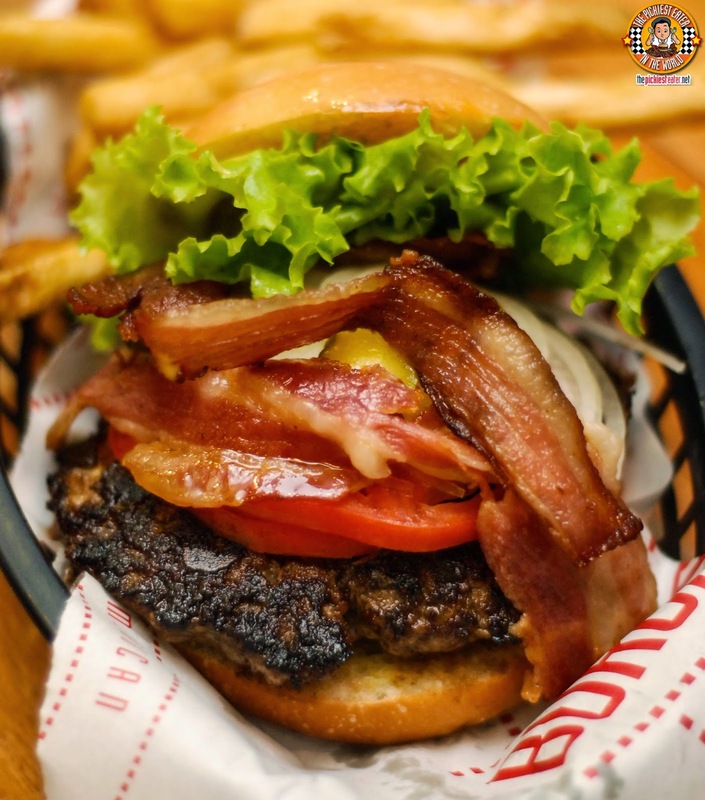 The Patty is then topped with the classic condiment combination of Pickles, Tomatoes, Onions and Lettuce, with the buns smeared with the soft buns smeared with Burger Joint's house sauce. 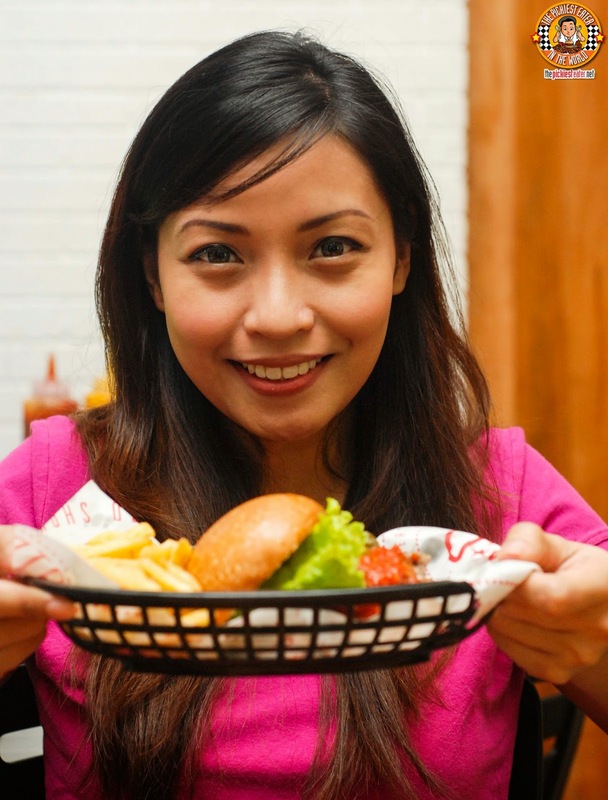 As he furiously worked on his burger, Rina told him she was surprised he didn't order a burger that had chili in it, especially when taking into consideration his love for spicy food. Dad said that, though he likes spicy food, he's not into whole chilis being added to food, such as jalapenos and the like. He enjoys Chili as a sauce. "Oh you mean like THIS? 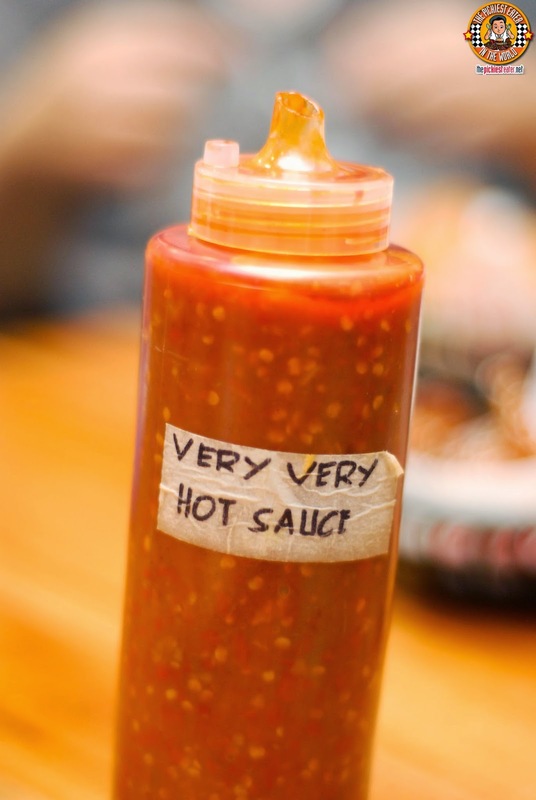 ", I asked as I slammed down a squirt bottle labeled "VERY VERY HOT SAUCE" right in front of him. Even just by looking at the bottle, you could see the chili seeds swimming inside.. You KNOW this was going to be a scorcher. 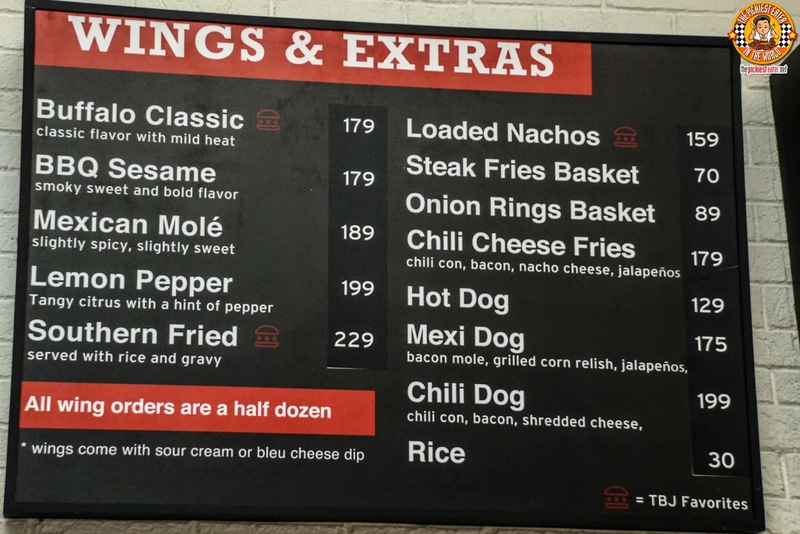 Lo, and behold, Dad added a few dabs on to the last bite of his burger, and the next thing you know, his sinuses was cleared, as well as two cans of Coke Zero. Funnily enough, he loved the Very Very Hot Sauce, and his only regret was he only got to enjoy it with his last bite (He was contemplating order another burger but decided eventually decided he was too full). 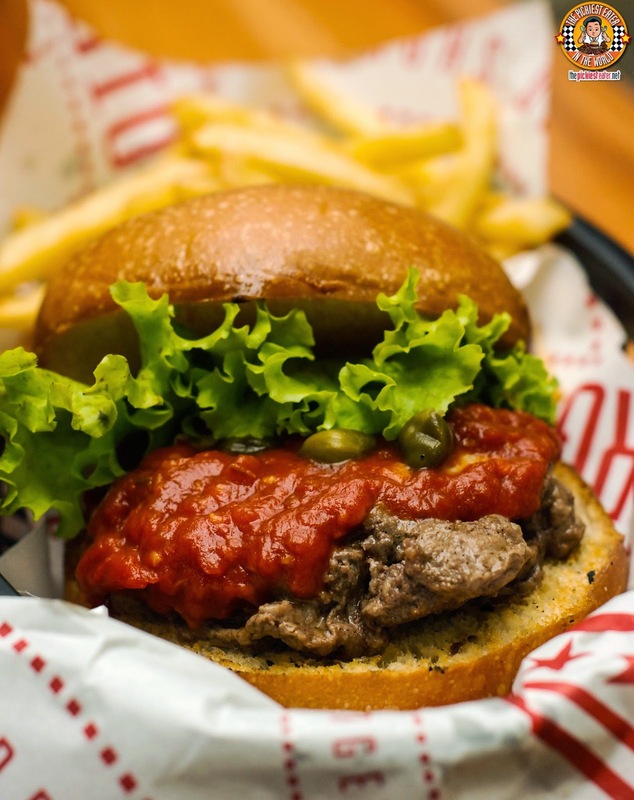 The Bambino (P169) offers an "Italian style" Burger, with the patty topped in a tangy Marinara sauce, speckled with Capers and melted Mozzarella Cheese. I had to abstain from trying this because of the strong acid on the marina sauce, but my friend Steph, who tried it, polished hers off in no time. The SoCal Beef Chorizo (P185) is quite the unique concoction, as it eschews the uses of the traditional Pure Beef patty for a Beef Chorizo one. 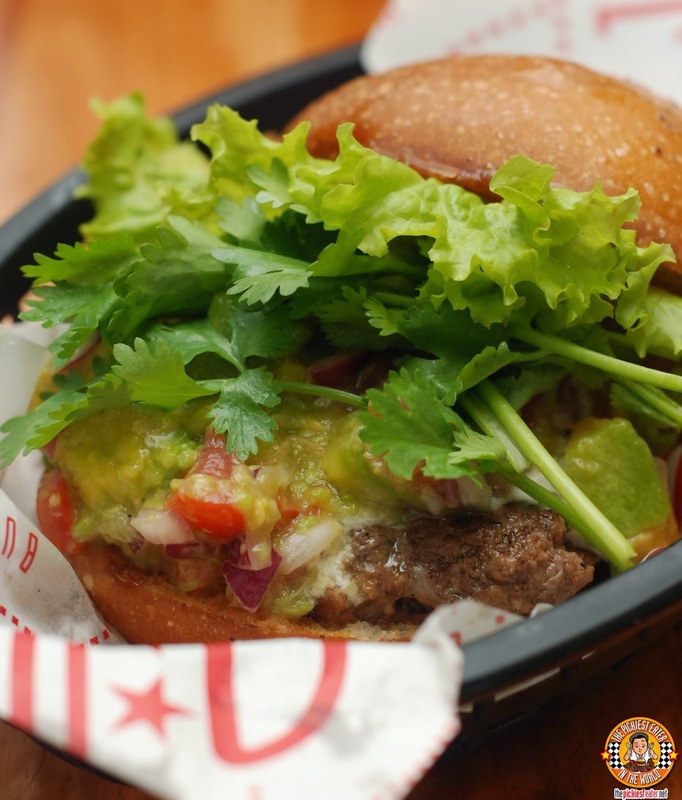 The potent flavor of the patty is undeniable, with the light sweetness of the guacamole serving as a delicious counterpoint. I'm not a big fan of Cilantro, but thankfully it was easy to take out. 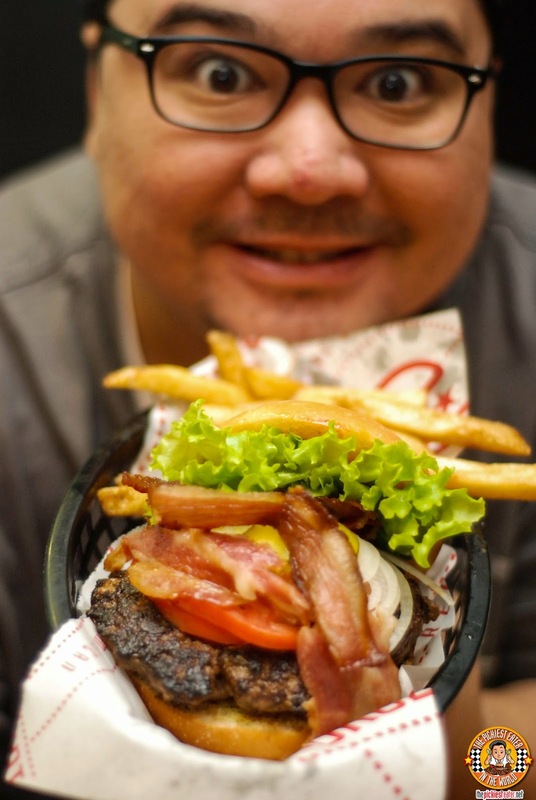 The Santa Fe (P175) is another burger that has Mexican roots. 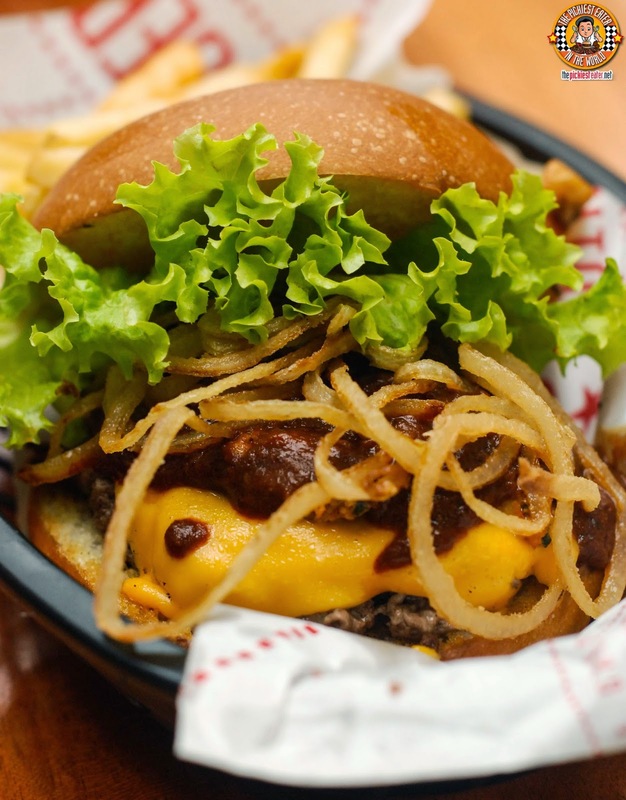 The Burger patty is coated in melted American cheese, and topped with a thick BACON MOLE sauce, and a handful of fried onion rings. The was a tasty smokiness to the mole that paired perfectly with the meatiness of the burger patty, with the crispy onion rings adding some texture to the burger. As soon as I saw it on the menu, there was no doubt in my mind that I was going to order the Pulled Pork Burger (P195). I love pulled pork, and I love burgers, so this was a no brainer. The great thing about this, is that the acid on the pulled pork was balanced just right, so it doesn't overwhelm the meatiness of the beef, but instead compliments it. I could eat the pulled pork as its own sandwich as well (Burger Joint, make it happen!). I also liked- nay, LOVED how my pulled pork had a small lining of fat to it! 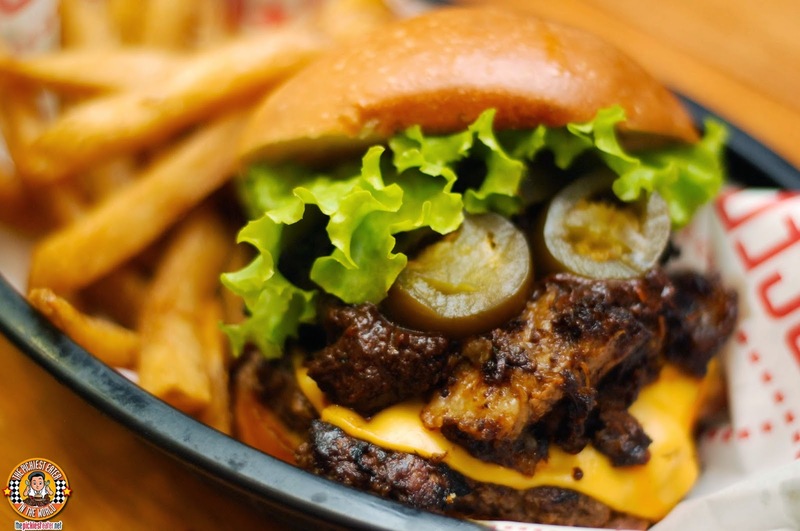 The delicious pulled pork is piled on to a cheese covered quarter pound patty burger, and is garnished with Jalapeno slices, and a small dollop of sour cream, which also helps temper the acid on the pulled pork. The buns are really nice and moist, but you need to eat your burger really quick because the meat is so incredibly juicy, it kinda softens the bun up a little. 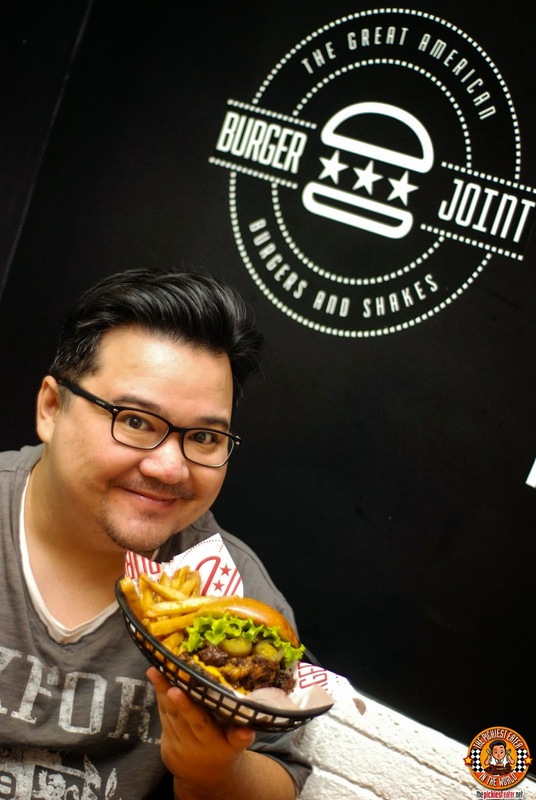 The star of The Burger Joint Show is the Juicy Lucy (P290). This is the burger that was tagged to me by my Instagram follower, and for good reason. Visually, its absolutely stunning. I noticed a moment of silence among the diners every time a Juicy Lucy is brought out of the kitchen and on to the table. The half pound patty had a gorgeous char on it, and was topped with slices of fresh Tomato, Pickles and Onions. Then, two strips of delicious smokey bacon is added to the heap. And when I say bacon, I mean two fantastic looking strips, and not the band aid looking type that other places serve (I still eat it though. Bacon pa rin yun, no!). A crisp lettuce leaf tops everything off. As I showed the burger to Rina, she bobbed her head up and down in obvious approval. Suddenly she stopped, and looked at it quizzically. She then looked at me and said, "Umm.. Where's the Cheese?". "Oh, Rina..", I said. "My sweet, innocent, little Rina". I smiled at her lovingly, and caressed her soft cheek. I pulled out a plastic knife, and sliced the side of the burger, and instantly, melted cheese oozed out, causing my wife's big brown eyes to almost come out of their sockets. The blend of the beef and cheese was impeccable, almost to a fault - Rina loved it so much, she didn't want any of the meat that didn't have cheese! (I'll add an extra slice of cheese next time). My qualm the first time we dined at The Burger Joint was the fries didn't seem like they were fresh. It was a little bit makunat, and the hue made me think that it was old fries that they re-fried. However, during my second visit, I noticed that the texture and hue of the fries was much better. Despite polishing off half of her hot dog, Rain couldn't help but admire the Juicy Lucy. Moments later, the food coma set in. 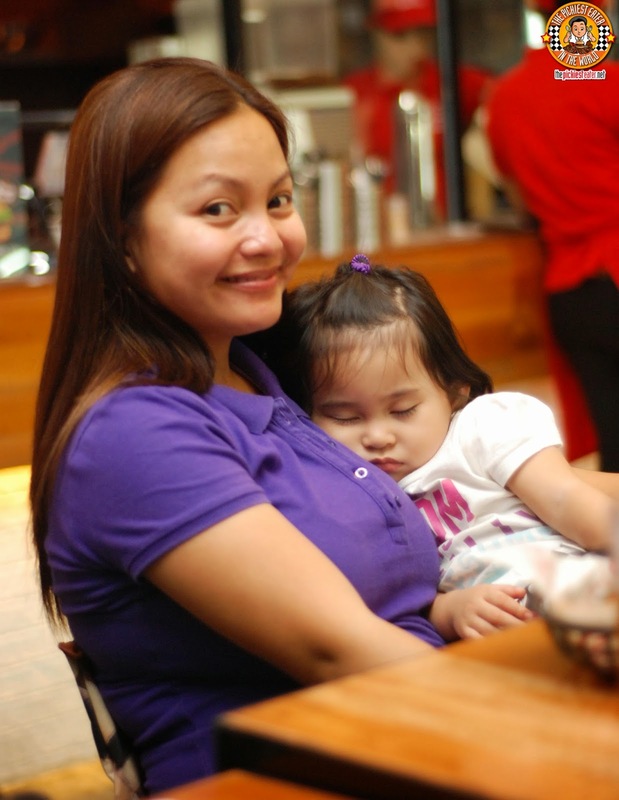 A true Kain-Tulog Gang Baby! I had promised my pretty friend, Steph, that we would meet to catch up, but we could never seem to get around to do so. Finally, we settled on a date. When I asked her, "What do you want to eat? she emphatically told me, "BURGERS!!".. So I immediately knew where to take her, making it my second trip to The Burger Joint in less than a week hehe.. In case you hadn't noticed, I really enjoyed the burgers of The Burger Joint! 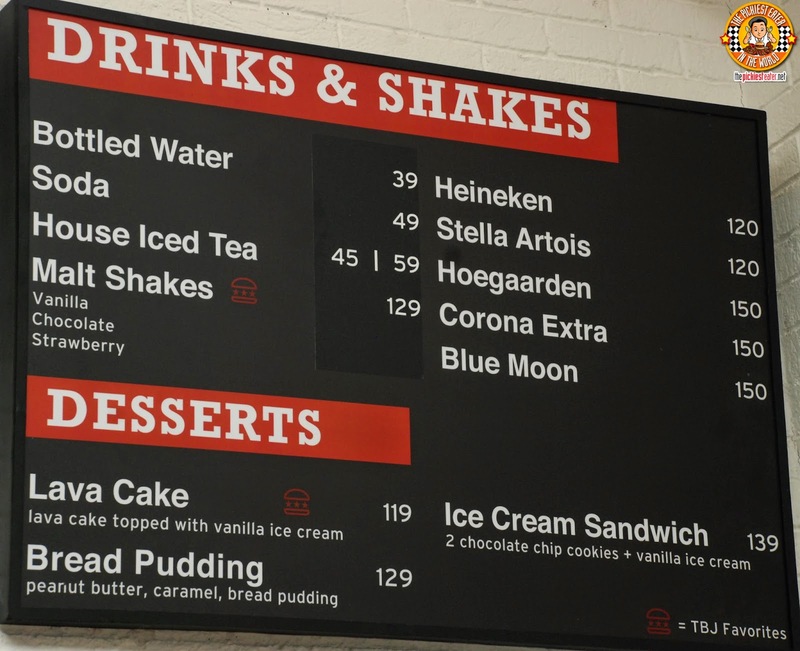 The prices are very reasonable, with no burger going over P300 bucks. The Burger Joint is definitely a great place to grab a meal with your family before you go grocery shopping, or having a few drinks with some friewith the only problem with being you might be so full after you'll end up wanting for fall asleep hehe..
have to try this soon!